Right off the bat, the 2019 legislative session has set its crosshairs on tax revenue. This theme ran through the declarations of intent from both Senate President Perkins and House Speaker Harshman. It also popped up in not-so-subtle terms in Governor Gordon's first speech. b) Higher taxes in recessions. The legislature may not treat the "revenue stabilization" issue as a matter of raising taxes in recessions - in fact, most of them would probably object to the idea if asked a direct question. 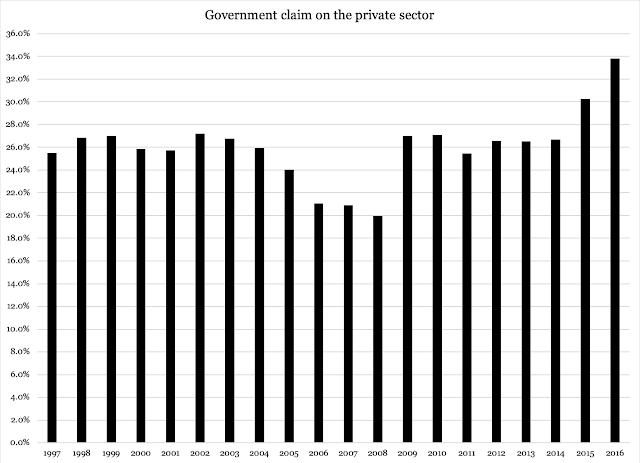 However, if you want to shield government from business cycles, the only way to do so is by taking more tax revenue from the private sector in recessions. The only way to take more tax revenue in recessions, is to raise the tax burden. Newly-elected Senate President Drew Perkins, R-Casper, addressed the 30-person body with a general speech of where the Legislature was headed: finding a solution to the state’s seemingly endless cycle of booms and busts while improving the revenue side of the state budget, an area where he and second-term Speaker of the House Steve Harshman, R-Casper, are in agreement. Please note: not only did Perkins say that he wants to protect government from the business cycle, but he also suggested "improving the revenue side" as a separate issue. There is only one way to interpret this: tax hikes. However, Senate President Perkins really does not need to separate the revenue stabilization efforts from the pursuit of more tax revenue. As we will see in a moment, the former is not possible without the latter. While following a similar narrative in the House, Harshman – presiding over a younger body with 10 new members – made sure to emphasize themes of bipartisanship and progress as the 60-person House of Representatives begins its work. He did so by looking back to the history of the state and the intentions of its founding fathers. He noted past successes, from the 23rd House of Representatives implementing the first sales tax in the Great Depression to Harshman’s second session, in which a proposal to create a merit-based scholarship passed after weeks of effort. In other words, Speaker Harshman thinks it was a success to introduce a new tax in the middle of the Great Depression. Has he considered how that new tax extended the depression here in Wyoming? More importantly: does this mean that the speaker thinks it would be a "success" to raise taxes right as we are heading into another economic downturn? That is definitely what he is suggesting; if I am misinterpreting him, the good speaker is welcome to explain wherein that misinterpretation lies. “People elected us to come here and solve problems,” he said. “I think it’s easy to just sit there and vote ‘no’ on everything – I’m sure we can build some kind of machine to do that. But the idea is to analyze, solve, debate and accomplish things. This whole solving and fixing, building and accomplishing is only possible with this type of selfless service for the people back home and following the golden rule. If we do that, and treat each other the right way, we’re going to be in great shape.” That attitude, he hoped, would extend itself to the most pressing and challenging issues currently facing the Legislature. While he lauded the House for its work whittling down a roughly $1 billion shortfall facing the schools in the not-so-distant past, he noted that the system is still highly dependent – about 65 percent for grades K-12 – on the price of oil and minerals. “It is repeatable if we don’t work to fix it, and there are things we can do to bring balance and more stability,” he said. 1. What exactly does he mean by "prosperity"? Is it a thriving private sector? Or a thriving government? 2. Does the speaker believe we can tax our way to prosperity? While we await Speaker Harshman's answers, let us make a solid note of the similarities in reasoning from Speaker Harshman and Senate President Perkins. I have predicted for a long time that the two chambers would eventually align to raise taxes, and we are now seeing clear signs of that. Harshman and Perkins will make sure that the legislature marches to one tune toward "revenue stabilization". Under their leadership, the legislature will make a concerted effort to build that spending shield, behind which government can continue to spend without having to accommodate the ups and downs that we in the private sector have to live with. The general themes of his intentions ... were clear: a desire to recognize the state’s wants versus its needs, a leaner — but not necessarily cheaper — government and, in what might be the most notable concern for his administration, a real solution to sustainably funding the state’s education system. A "sustainable" funding model for education sounds a great deal like what we just heard from the legislative leadership. Does this mean that the governor is ready to go ahead with what Senate President Perkins said about "improving revenue" - raising taxes - and Speaker Harshman's implied point about taxes and prosperity? Throughout the primary season and the campaign up to the November election, Mark Gordon was careful not to express any distinct opinions on any issues relating to the state budget. Despite frantic searching, I have been unable to find a single statement from him where he comes out against higher taxes. In this his first speech, Governor Gordon appears to be leaning in favor of a tax reform that would on balance raise the tax burden on the Wyoming economy. Is that a fair interpretation of where the governor stands on this issue? He does, namely, also say that he wants to "work together with educators and lawmakers to find a lasting solution to school funding". This sounds a great deal like what we just heard Speaker Harshman say. It is pretty clear that the legislature will pursue that spending shield. So far, there are no bills introduced for the 2019 session that explicitly seek to protect the state budget from economic recessions. The five bills that, so far, discuss taxes are straightforwardly about raising taxes. Therefore, I suspect we have a lot more to expect before the filing deadlines. 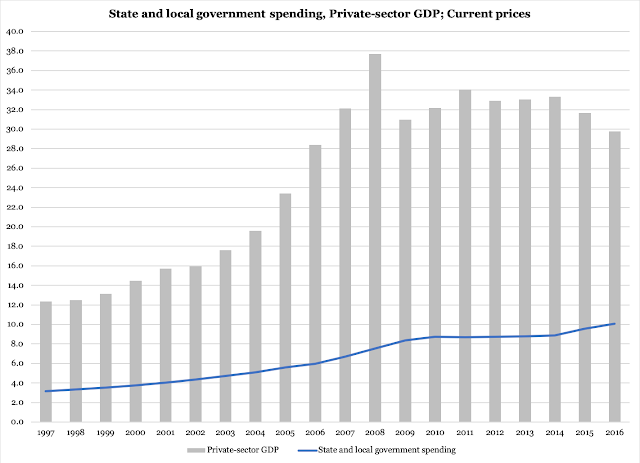 Since 2009 the private sector has been struggling, while government has continued to slowly but relentlessly grow its spending; under a formal spending shield, this would have required an increase in taxes, right as private businesses were laying off workers because sales were down. The sharp downturn in private-sector output in 2009 makes for a stark image of the last point. That year, Wyoming businesses lost $6.7 billion of production, sales and income. Since government continued to spend as usual, its share of private-sector output shot up from 20 to 27 percent. Plain and simple: a spending shield would have required tax increases of $844 million - in one year, the year when the Wyoming economy was in free fall. Here is another way to look at these numbers: to prevent tax hikes the private sector would have had to produce $41.8 billion worth of output, sales and income. In other words, government continued to spend as if taxpayers had 35 percent more money than they actually did. So far, our state has not created a formal spending shield for government. Our lawmakers, state and local, have continued to spend despite the booms and busts in the private sector, but they have plugged the inevitable holes in the budget with saved money. Now they apparently want to formalize that spending shield, which means some sort of tax system where the tax burden goes up in recessions (but does it fall in growth periods?) and therefore adds to bad times for Wyoming families and businesses. Until we see the formal path that the legislative leadership intends to take, we don't know exactly what the spending shield is going to look like. However, regardless of how that shield is constructed, its macroeconomic effects are going to be largely the same: higher taxes and taxes that destabilize the private sector. *) Due to a glitch in Census data for state and local government spending, there are no annual numbers from any state for 2001 and 2003. Therefore, those numbers have been calculated as averages of the years immediately preceding and following those years. STOP SPENDING!! Wyoming has the highest number of government workers of any state in the union at over 24%. Nearly one out of every four people in Wyoming either work for the federal, state, or a local government. Again, the highest in nation, number 1 out of 50. Do we really need that many employees? If you can't pay your bills, what is the first thing you do? Go ask your employer for a raise? No, you cut expenses. That is what the people we hired to work for us, like Perkins and Case need to realize. We hired them to work for us just like any other employer, and now they are asking us for a raise. And I'm telling them to cut my expenses.